CleanAIR® canister filters range offers a wide selection of filters for various respiratory tasks. Highest quality filter media and well mastered in-house technology of filters production ensure the highest quality you need. Our filters are fully EN approved according to the following standards (EN 143:2001/A1, EN 12941/A2, EN 12942/A2, EN 14387. Combined and particle filters are marked „R“ for re-usable. CleanAIR® filters are manufactured with the thread RD40x1/7“ in accordance with EN148-1. Particle filters trap solid and liquid aerosols (dusts, smoke, fumes, mists, bacteria, viruses and radioactive particles) – contain only the particulate filter. 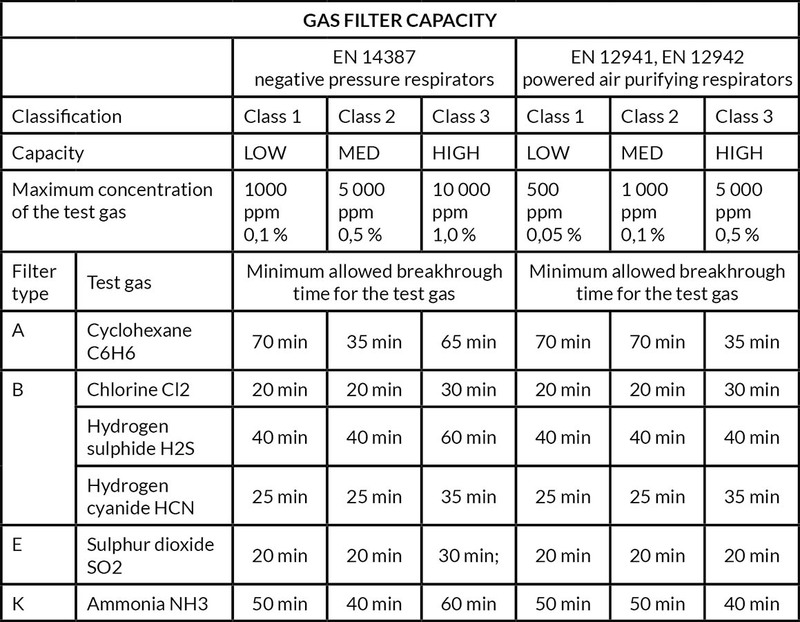 Gas filters protect you against hazardous gases and vapours – contain only the activated carbon. Combined filters protect you against both gaseous and particulate contaminants – contain both layers (activated carbon and particulate filter). CleanAIR® canister (cartridge) filter housing is made of high durable plastic, the inner content consists of two different parts. Activated carbon removes chemical agents such as gases and vapours from contamined air. P3 class filter media removes solid and liquid particles from the contamined air. Carbon is activated by breaking down carbon structure with steam or chemicals. This creates many fine channels, known as pores, in the carbon structure. These pores are finely grained so that the polluting molecules can penetrate them and bond with their surface. Depending on the level of activation, activated carbons have an active internal surface area ranging from 750 m2/g to 1,600 m2/g. Activated carbons may be pure carbons (used for A type filters) or carbons impregnated with various impregnants giving e.g. oxidizing, acidic or alkaline properties. Purely activated carbon removes many odorous substances from the air, including organic solvents or poisons – adsorption. However, some common gaseous chemicals such as cyanides or ammonia are adsorbed poorly, or not at all. Activated carbon must be impregnated to eliminate these poisons. To do this, large internal surface is coated with reactants for these poisons – chemisorption. Another group of chemicals can be removed with catalysts (for example phosphines, etc.). In this case, the activated carbon is coated with these catalysts. The catalyst promotes a chemical reaction without its own properties changing. Its sole function is to facilitate the reaction. The particle’s filter ability to trap airborne particles depends on physical and mechanical properties of the filter media such as interception, inertial impaction, diffusion and electrostatic attraction. Material used for particle filtration is made of sheets of randomly arranged glass microfibers with various diameter 1-10 µm. Interception – small and light particles can be carried past the fibers by the stream of air. If the particle gets close to the fiber (the particle’s center gets closer to the fiber than the particle’s diameter), it colides with the fiber, gets caught and sticks to it. The bigger the particle, the more effectively interception works. Intertial impaction – the moment of innertia of heavier particles is too big to follow the airflow passing around the fiber. These particles keep following their original path and therefore impact the fiber. Efficiency of inertia increases with the speed of the air flow, the particle size and decreasing fiber size. Diffusion – particles smaller than 1 μm in size don’t follow the path of the airflow past fibers. They are influenced by the Brownian motion. When touching the fiber they adhere to it. The possibility that these particles are traped by the diffusion principle increases with a decreasing speed of the air flow and decreasing particle and fiber size. Electrostatic attraction – smaller particles are retained on the fibers by a weak electrostatic force after contacting the fiber. European standard EN 143 defines following classes of particle filters that can be attached to a face mask (full face mask or half mask). The operation lifetime mainly depends on concentration of particulate contaminants on the workplace, humidity and used airflow. Particle filters get clogged with particles and with humidity. Immediatelly replace your filter when the breathing resistence has increased. If used against radioactive substances or bacteria and viruses, filters are recommended for single use only!